Mahua longifolia is an Indian tropical tree found largely in the central and north Indian plains and forests. 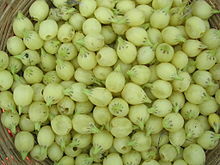 It is commonly known as mahuwa, mahua, mahwa, mohulo, or Iluppai or vippa chettu. It is a fast-growing tree that grows to approximately 20 meters in height, possesses evergreen or semi-evergreen foliage, and belongs to the family Sapotaceae. It is adaptable to arid environments, being a prominent tree in tropical mixed deciduous forests in India in the states of West Bengal, Chhattisgarh, Jharkhand, Uttar Pradesh, Bihar, Maharashtra, Telangana, Madhya Pradesh, Kerala, Gujarat, Odisha and Tamil Nadu. 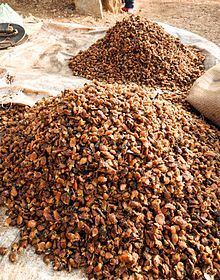 It is cultivated in warm and humid regions for its oleaginous seeds (producing between 20 and 200 kg of seeds annually per tree, depending on maturity), flowers and wood. The fat (solid at ambient temperature) is used for the care of the skin, to manufacture soap or detergents, and as a vegetable butter. It can also be used as a fuel oil. The seed cakes obtained after extraction of oil constitute very good fertilizer. The flowers are used to produce an alcoholic drink in tropical India. This drink is also known to affect the animals. Several parts of the tree, including the bark, are used for their medicinal properties. It is considered holy by many tribal communities because of its usefulness. The tree is considered a boon by the native tribes who are forest dwellers and keenly conserve this tree. However, conservation of this tree has been marginalised, as it is not favoured by non-native tribes. The leaves of Madhuca indica (= M. longifolia) are fed on by the moth Antheraea paphia, which produces tassar silk, a form of wild silk of commercial importance in India. Leaves, flowers and fruits are also lopped to feed goats and sheep. The Tamils have several uses for M. longifolia (iluppai in Tamil). The saying "aalai illaa oorukku iluppaip poo charkkarai" indicates when there is no cane sugar available, the flower of M. longifolia can be used, as it is very sweet. However, Tamil tradition cautions that excessive use of this flower will result in imbalance of thinking and may even lead to lunacy. The alkaloids in the press cake of mahua seeds is reportedly used in killing fishes in aquaculture ponds in some parts of India. The cake serves to fertilise the pond, which can be drained, sun dried, refilled with water and restocked with fish fingerlings. The mahua flower is edible and is a food item for tribals. They use it to make syrup for medicinal purposes. They are also fermented to produce the alcoholic drink mahua, a country liquor. Tribals of Bastar in Chhattisgarh and peoples of Orissa, Santhals of Santhal Paraganas (Jharkhand), Koya tribals of North-East Andhra Pradesh (vippa saara: విప్ప సారా) , Bhil tribal in western Madhya Pradesh and tribals of North Maharashtra consider the tree and the mahua drink as part of their cultural heritage. Mahua is an essential drink for tribal men and women during celebrations. The main ingredients used for making it are chhowa gud (granular molasses) and dried mahua flowers. The liquor produced from the flowers is largely colourless, opaque and not very strong. The taste is reminiscent of sake with a distinctive smell of mahua flowers. It is inexpensive and the production is largely done in home stills. Mahua flowers are also used to manufacture jam, which is made by tribal co-operatives in the Gadchiroli district of Maharashtra. 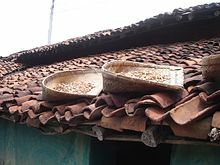 In many parts of Bihar, such as villages in the district of Siwan, the flowers of mahua tree are sun-dried; these sun-dried flowers are ground to flour and used to make various kinds of breads. The locals also use mahua flowers to make wine. Trifed, a website of the Ministry of Tribal Affairs, Government of India reports: "Mahua oil has emollient properties and is used in skin disease, rheumatism and headache. It is also a laxative and considered useful in habitual constipation, piles and haemorrhoids and as an emetic. Native tribes also used it as an illuminant and hair fixer." It has also been used as biodiesel. Other botanical names: Bassia longifolia L., B. latifolia Roxb., Madhuca indica J. F. Gmel., M. latifolia (Roxb.) J.F.Macbr., Illipe latifolia (Roxb.) F.Muell., Illipe malabrorum (Engl.) Note: the authentic genus Bassia is in the Chenopodiaceae. The names B. longifolia and B. latifolia are illegitimate. Synonymous names for this tree in some of the Indian states are mahua and mohwa in Hindi-speaking belt, mahwa, mahula, Mahula in Oriya and maul in Bengal, mahwa and mohwro in Maharashtra, mahuda in Gujarat, ippa puvvu (Telugu: ఇప్ప) in Andhra Pradesh, ippe or hippe in Karnataka (Kannada), illupei or இலுப்பை in Tamil, poonam and ilupa in Kerala (Malayalam) and mahula, moha and modgi in Orissa (Oriya). ^ a b c d "Product profile, Mahuwa, Trifed, Ministry of Tribal Affairs, Government of India". Trifed.nic.in. Archived from the original on 2009-06-19. Retrieved 2013-11-21. ^ Mark Duell (2012-11-07). "Trunk and disorderly! Herd of 50 drunken elephants ransack village after gulping down 500 LITRES of alcohol in shop". London: Dailymail.co.uk. Retrieved 2013-11-21. ^ "Mahuwa tree and the aborigines of North Maharashtra, D.A.Patil, et al". Niscair.res.in. Retrieved 2013-11-21. ^ "Non-Wood Forest Products in 15 Countries Of Tropical Asia : An Overview". Fao.org. Archived from the original on 2014-04-18. Retrieved 2013-11-21. ^ "Mahuwah". India9.com. 2005-06-07. Retrieved 2013-11-21. ^ "Forest department, LIT develop new products from mahua - The Times of India". The Times Of India. 2012-12-04. ^ "Farm Query - Mahua oil". The Hindu. Chennai, India. 2014-01-22. ^ "File:Madhuca longifolia var latifolia (Mahua) fruits Melghat Tiger Reserve Maharashtra 56 249.jpg - Wikimedia Commons". Commons.wikimedia.org. Retrieved 2013-11-21. Wikimedia Commons has media related to Madhuca longifolia. "Madhuca longifolia (J. Konig) J. F. Macbr". Integrated Taxonomic Information System. Boutelje, J. B. 1980. Encyclopedia of world timbers, names and technical literature. Duke, J. A. 1989. Handbook of Nuts. CRC Press. Encke, F. et al. 1993. Zander: Handwörterbuch der Pflanzennamen, 14. Auflage. Govaerts, R. & D. G. Frodin. 2001. World checklist and bibliography of Sapotaceae. Hara, H. et al. 1978–1982. An enumeration of the flowering plants of Nepal. Matthew, K. M. 1983. The flora of the Tamil Nadu Carnatic. McGuffin, M. et al., eds. 2000. Herbs of commerce, ed. 2. Nasir, E. & S. I. Ali, eds. 1970–. Flora of [West] Pakistan. Pennington, T. D. 1991. The genera of the Sapotaceae. Porcher, M. H. et al. Searchable World Wide Web Multilingual Multiscript Plant Name Database (MMPND) - on-line resource. Saldanha, C. J. & D. H. Nicolson. 1976. Flora of Hassan district. Saldanha, C. J. 1985–. Flora of Karnataka.